This appetizer was one of the dishes served during the Portuguese Food Festival held a few years ago in Hotel InterContinental. Steeped in vinegar and mixed with onions and parsley, it has a sour-spicy taste reminiscent of the Filipino kinilaw. 1. 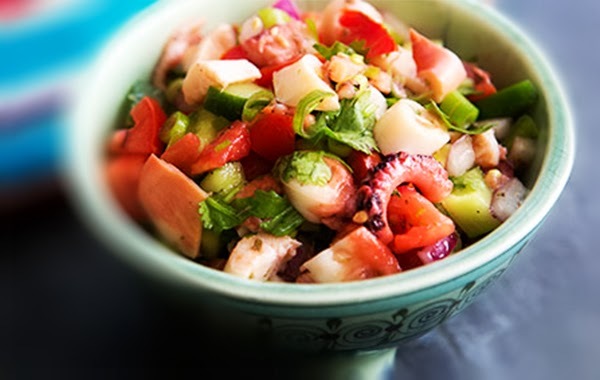 In a large casserole, combine octopus, half of the onions and enough water to cover. Bring to a boil then lower heat to simmer. Simmer for about 1 minute or just until octopus is tender. 2. Drain octopus and slice into small pieces. Let cool. 3. Blend in vinegar and remaining onions. Sprinkle parsley on top. Serve as a first course or appetizer .